It's hard to believe that today is Chuck Norris's 74th birthday. His hair is still as red as it was the first day his foot met someone's jaw, and he was just in Expendables 2. Since the "facts" about him started emerging in 2005, it's been tough to separate the truth from the legend. 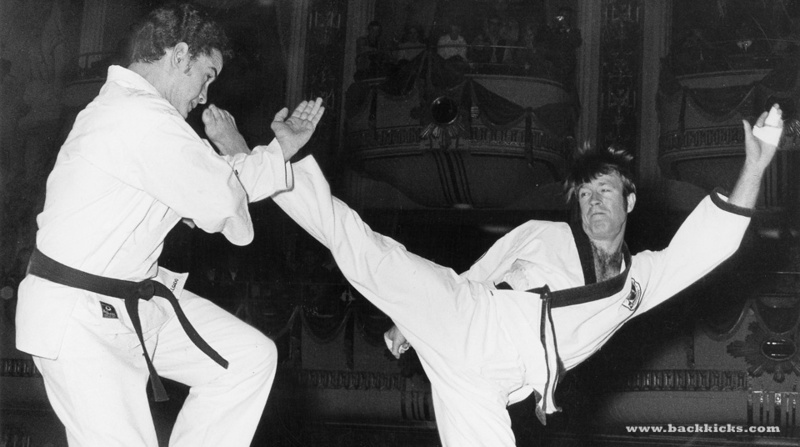 So to honor his 74th, here are 11 completely, utterly, true facts about Chuck Norris. And with the truth this awesome, there really was never a need for the fiction. His real name isn't "Chuck" or even "Charles." It's actually Carlos Ray Norris. Which is somehow even more awesome. He hasn't lost a fight since 1968. All ten of his losses came early on, giving him a record of 168-10-2 at the end of his long career. He invented his own martial art. You probably know all about his six straight Professional Middleweight Karate Championship titles (who doesn't? ), but he eventually got bored and had to start his own hustle, which he called Chun Kuk Do, which means "Universal Way." He taught Steve McQueen Karate. In return, McQueen encouraged him to get into acting. The two were also friends with Bruce Lee, and were pallbearers at Lee's funeral, which McQueen attended in a gorgeous denim jacket. Chuck also taught Donny Osmond, but somehow resisted the urge to go into musical theater. When Chuck Norris is silent around you, you should be worried. Chuck has a personal code, which he lent to Chun Kuk Do. In that code it says in no uncertain terms: "If I have nothing good to say about a person, I will say nothing." One can only assume this has resulted in a lot of people digging themselves into some very large holes around Chuck, because he'll let you keep talking. He was a spokesman for the World of Warcraft Series. Which is absolutely ridiculous, when you think about it. He was the first westerner to be given the rank of 8th Degree Black Belt Grand Master in Taekwondo. He also has black belts in Judo, Brazilian Ju-Jitsu, and Tang Soo Do. He was an Air Policeman in the USAF. The martial arts all started when he was stationed in South Korea. He was also named an honorary Marine and Texas Ranger, probably in deference to his unaffiliated series of recruiting videos, "Walker,Texas Ranger." He had his own line of jeans. 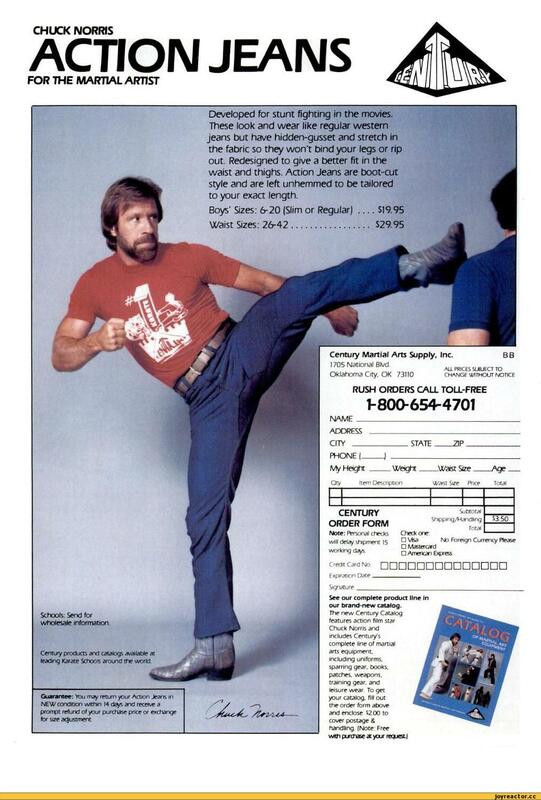 The were called "Action Jeans" and had superior mobility to let a man move, allowing Chuck's signature roundhouse kick to be possible without a massive crotch rip. He likes to break a mental sweat too, and is a New York Times Best Selling author. Some of his literary pursuits include Black Belt Patriotism: How to Reawaken America, the autobiographical Against All Odds, and two works of fiction — The Justice Riders and A Threat to Justice. Just like Einstein's grades, Chuck was not athletic in high school. But he sure bloomed. So you still have hope, young grasshopper. Ethan Wolff-Mann is the Gear editor of Supercompressor. His forthcoming book on Chuck Norris, The Accidental Meme, will not be available in fine bookstores everywhere on April 1st. Follow him on Twitter @ewolffmann.